Real Madrid are currently leading the table with Atletico at 9th spot. 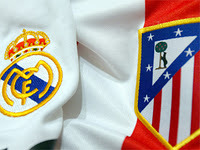 Real Madrid haven´t lost a derby to Atletico at the Bernabeu since the 1999/2000 season. The Whites have earned five victories and as many draws in the last ten derbies at their stadium. The last time they lost to Atletico as locals was in the 1999/2000 campaign.